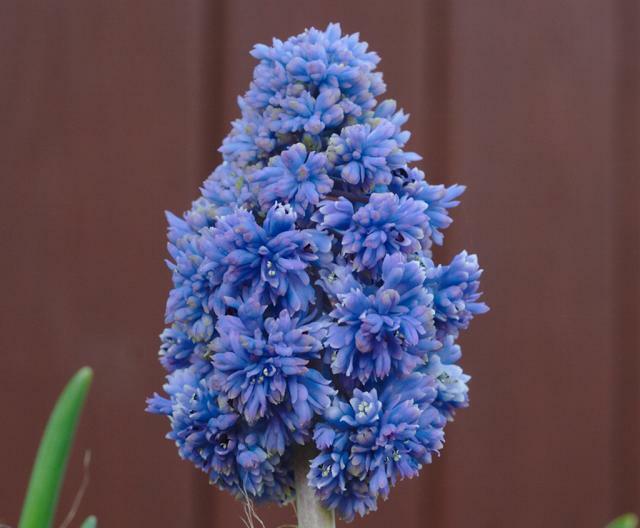 Muscari is a genus in the Hyacinthaceae family. This genus can be divided into fairly distinct groups. These groups are considered by some authorities to be subgenera and by others to be genera in their own right. At least two of them, Leopoldia an Pseudomuscari are accepted as genera by The Plant List. 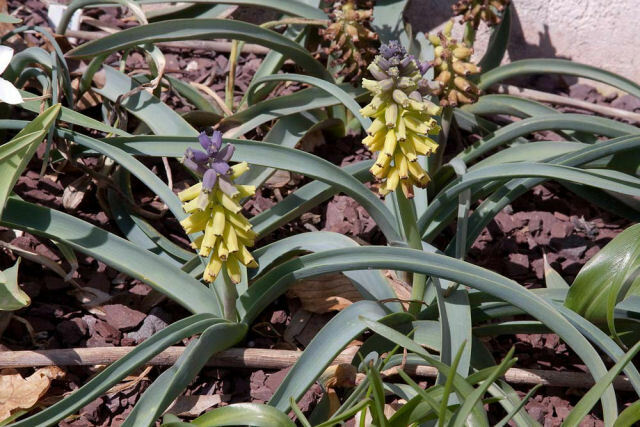 A good discussion of this genus can be found in The Smaller Bulbs by Brian Mathew. 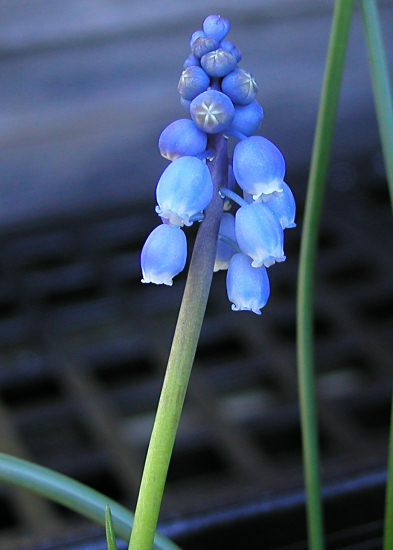 The Botryanthus group, sometimes called the true Grape Hyacinths, all have pale blue to blackish-blue flowers (apart from the occasional albino) that are usually globose to obovoid in shape with a very constricted mouth. They are carried in racemes which are compact and dense with the flowers almost touching, although they may become spaced out later on. These are mostly easy to cultivate and flower in early spring. 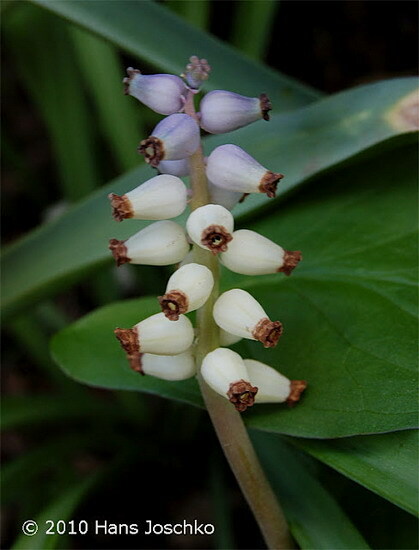 The Pseudomuscari group is now considered a genus with flowers in shades of blue, often pale or rather bright blue, and are mostly smallish plants with fairly densely flowered racemes. The characteristic feature is that the bell-shaped perianth is not constricted at the mouth. They are also early spring-flowering and easily cultivated. The Leopoldia group is now recognized by many as deserving genus status. These are on the whole much taller plants than the above two groups with the flowers more widely spread on the raceme. 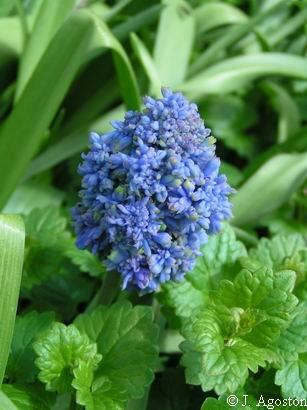 The fertile flowers are longer, usually urn-shaped or tubular with angular 'shoulders' just below the constricted mouth. 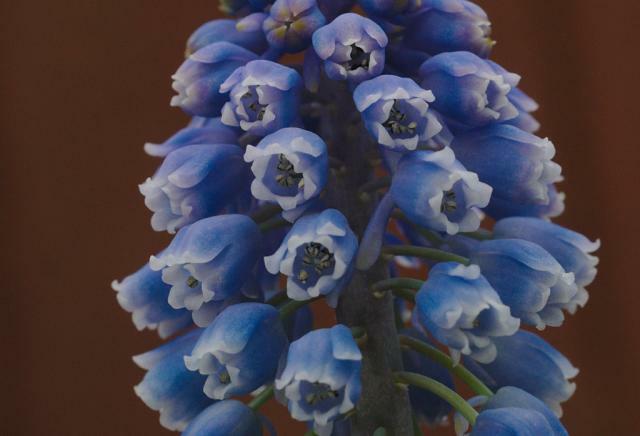 The colour is usually some shade of whitish, yellowish, greenish or brown, never blue, although there is often a conspicuous tuft of bright violet, blue or pinkish sterile flowers at the top of the raceme. This group or genus blooms later in the season, in late spring or early summer. They are relatively easy to cultivate in warm sunny situations. 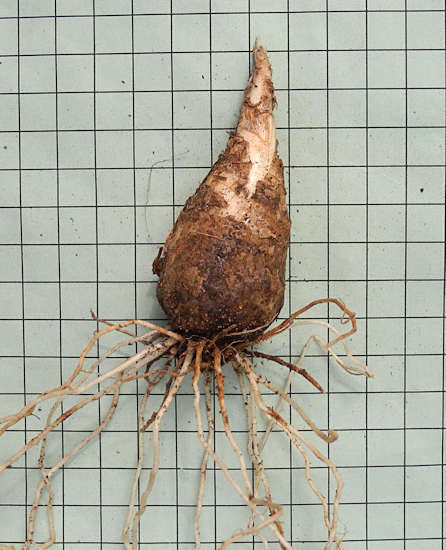 The Muscarimia group has two species with large bulbs with thick fleshy perennial roots which delve down into the rocky ground of their natural habitat in Turkey and the east Aegean region. The stout stems carry racemes with large elongated flowers with six projections below the mouth. 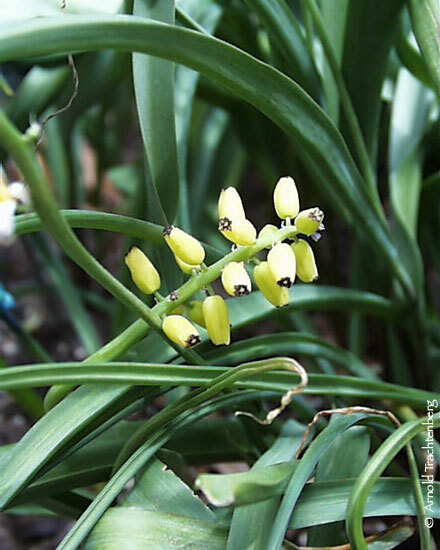 Flowers are fragrant and yellow or white, faintly tinted green or blue, with brown lobes which are so small that they are more like small teeth. Sterile flowers are few, minute and violet, or none. 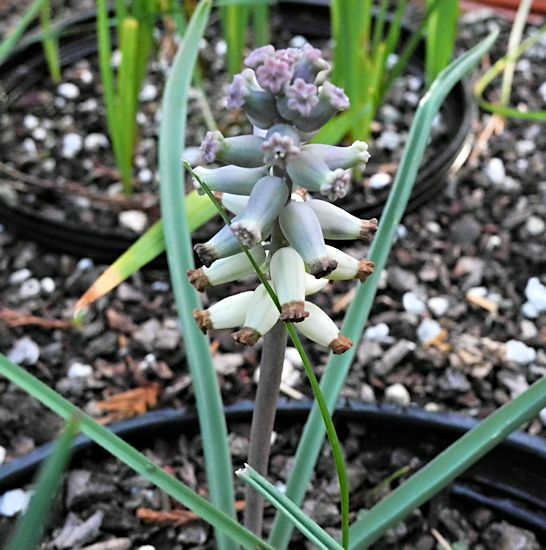 Since they come from hot sun baked hillsides they are best grown in a bulb frame or alpine house in a deep pot to accommodate their strong roots. Species can be found in their natural habitats around the Mediterranean Sea from Spain all the way round to Morocco. Many species originate from Turkey but some can be found in the Caucasus. They grow in vineyards in Austria and France. They are even found in the USA as garden escapees. Some grow on dry mountain slopes, some in (mountain) meadows. 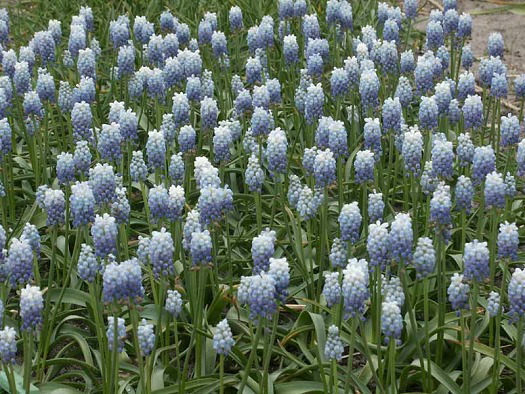 There is a muscari for every situation. They prefer a neutral to alkaline soil although a slightly acid soil will usually be tolerated. Good drainage is essential. All species like a sunny to semi-shady spot. Planting depth should be twice the height of the bulb. For naturalizing I would recommend a bit deeper, especially in colder areas. Winter hardiness is not a problem; they will survive most cold winters. 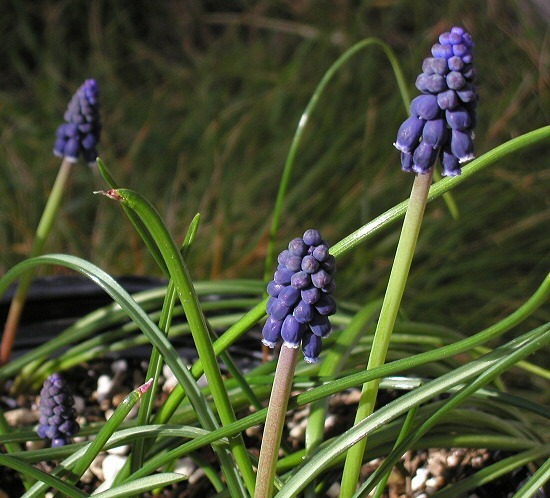 Rock gardeners will get great value out of many Muscari species. 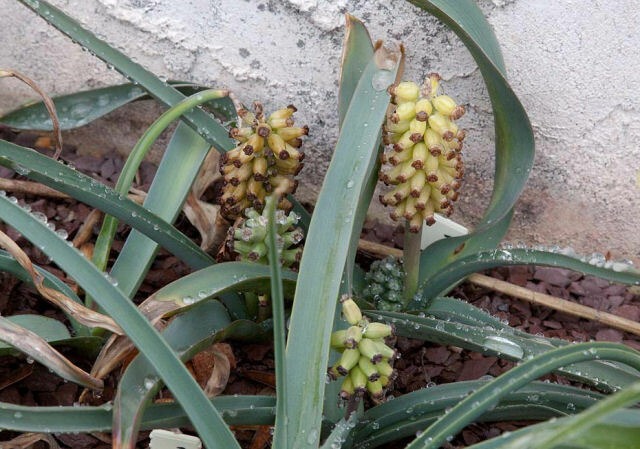 Choose the ones that don’t multiply too rapidly; otherwise the bulbs can get too invasive. 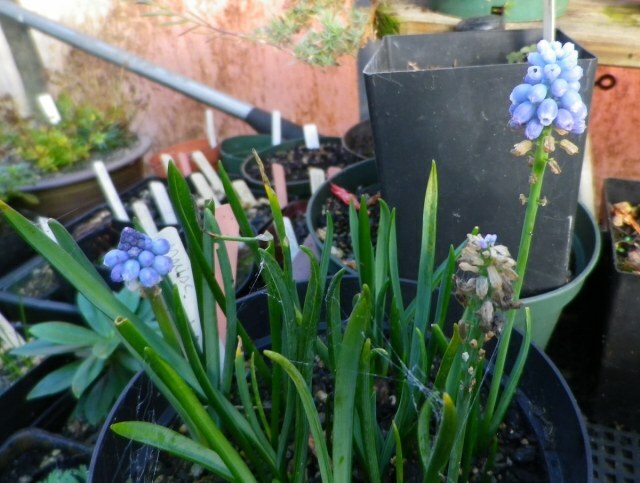 Cultivars of Muscari armeniacum and Muscari neglectum are such rampant growers. 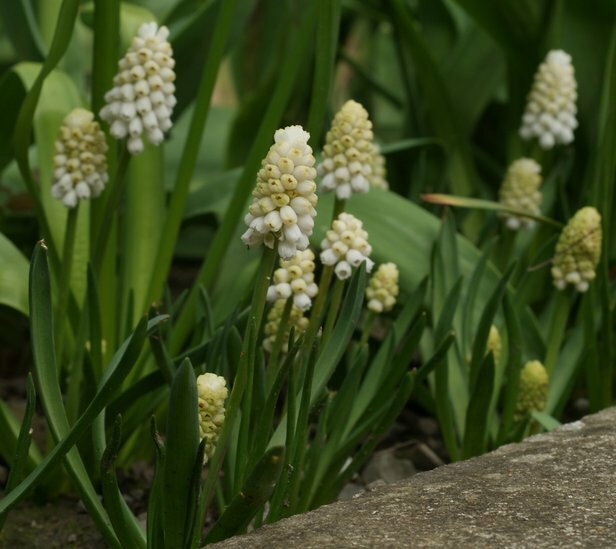 For a touch of delicacy try Muscari pallens instead, or choose the bulbs of Muscari macrocarpum, for its bright yellow flowers and lovely sweet fragrance. 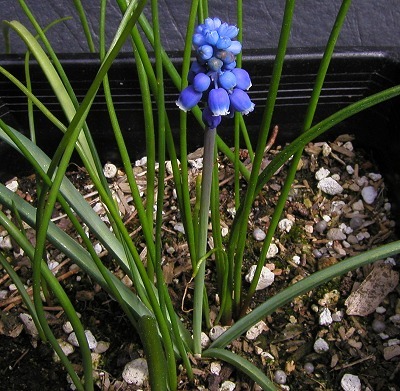 Martin Phillipo has provided much of the information on this page in his Introduction to the topic of the week when Muscari was discussed in May 2003. His introduction also includes a lot of cultivation information. Visit his web site for complete information on this genus. 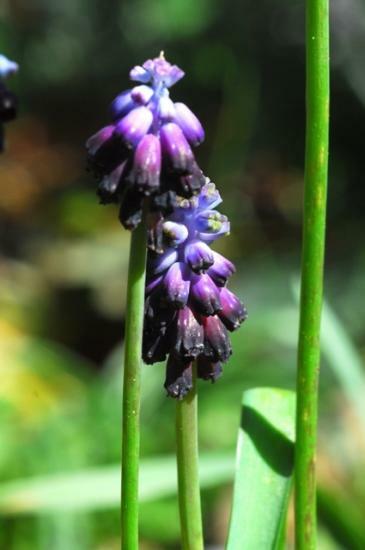 Muscari armeniacum, a member of the Botryanthus group, is widespread in woods and meadows from Greece east throught Turkey to the Caucasus. It is the most commonly cultivated species and increases well, naturalizing in many places. Photos by Janos Agoston. 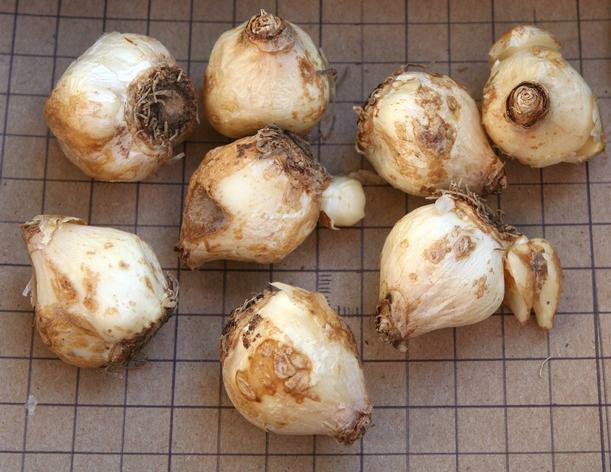 Photo of bulbs on a 1 cm grid by M. Gastil-Buhl. 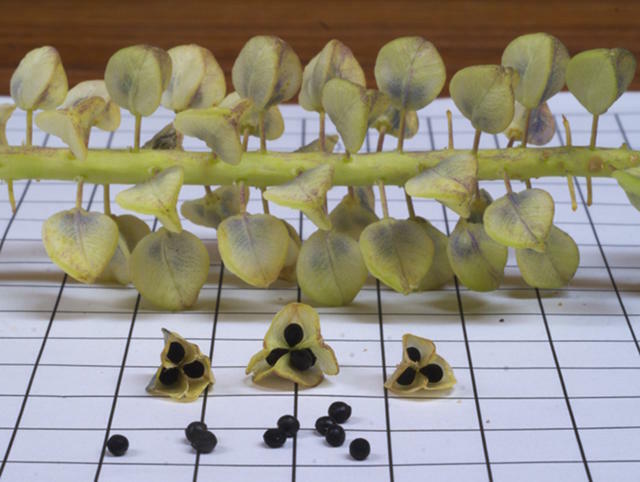 Photo of seed and seed pods by David Pilling on a 1 cm grid, from which it is apparent the stems elongate after flowering. 'Côte d'Azur' in the first photo taken by Martin Philippo, a cultivar, noticeable for its clear blue color. The flowers were grown in a pot. This photo was taken on a tripod, shutter time 1/60 at the highest resolution from a distance of 27 cm (macro). The second photo by the same contributor, 'Peppermint', another cultivar, was grown from seed. The picture is a "field" showing Martin's entire stock. The next cultivar photos was taken by Janos Agoston. 'Fantasy Creation' is a double-flowered cultivar with a large pyramidal raceme resembling broccoli. 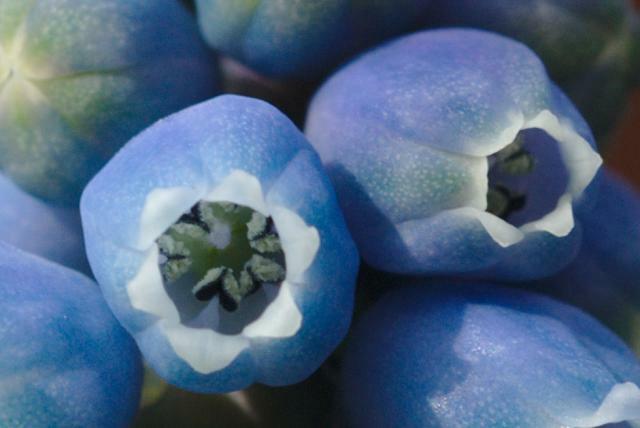 Its blue flowers gradually turn purple, then green, fading toward yellow. The fourth photo from Jim McKenney is of 'Saffier'. 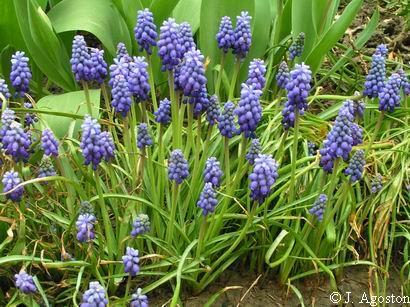 It is one grape hyacinth which stands out from the crowd. 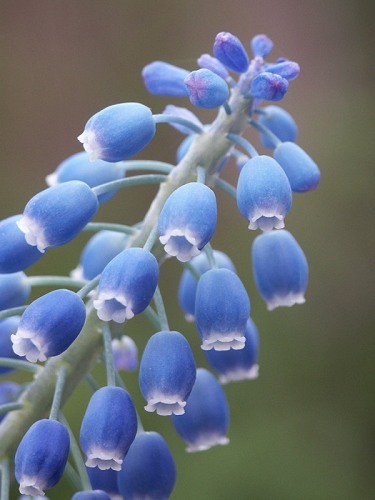 The flowers are shaped like a pumpkin rather than the typical grape hyacinth bell or tube. And they are widely spaced in the raceme. 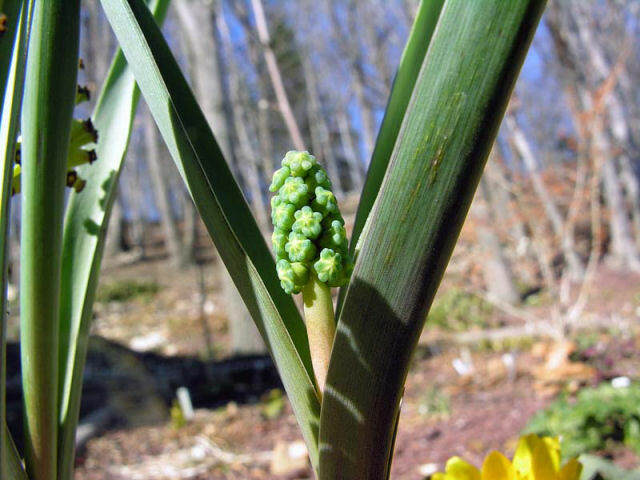 This gives the inflorescence the appearance of being perpetually in bud. On close examination, it will be seen that some of the flowers are open and do have a tiny style. The last photo from Mary Sue Ittner is of 'Canteb'. 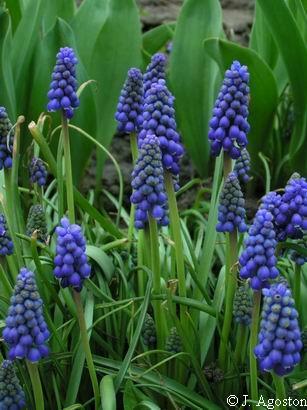 These bulbs where supplied as Muscari armeniacum 'Blue Spike' and range from single to very double flowers. Photos by David Pilling. 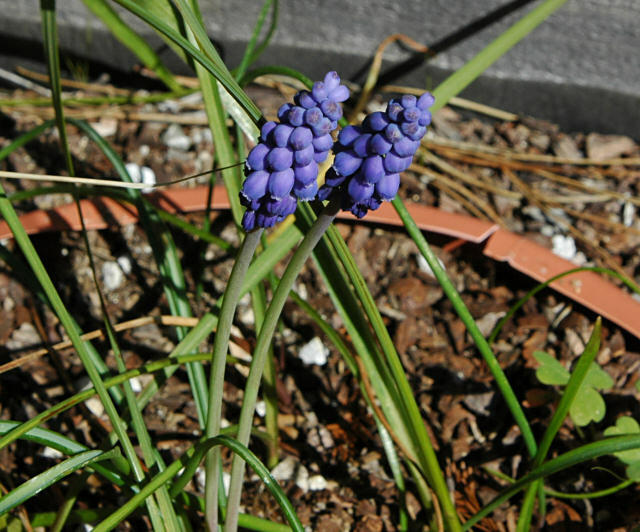 Muscari argaei is considered by The Plant List to be a synonym for Muscari armeniacum. 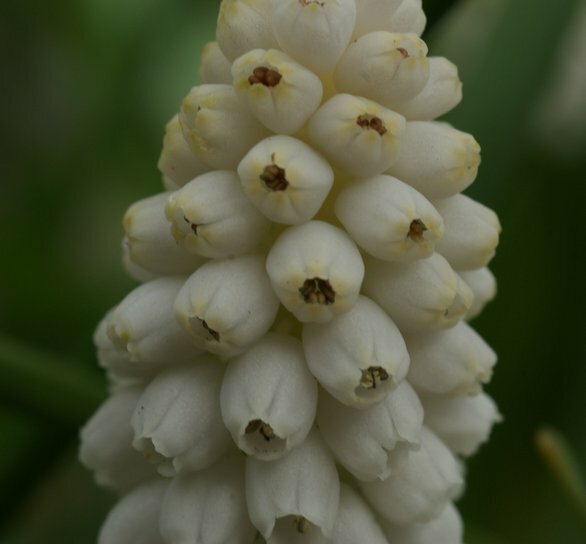 The white form is sold under the name Muscari argaei 'Album' and it seems readily available under this name. 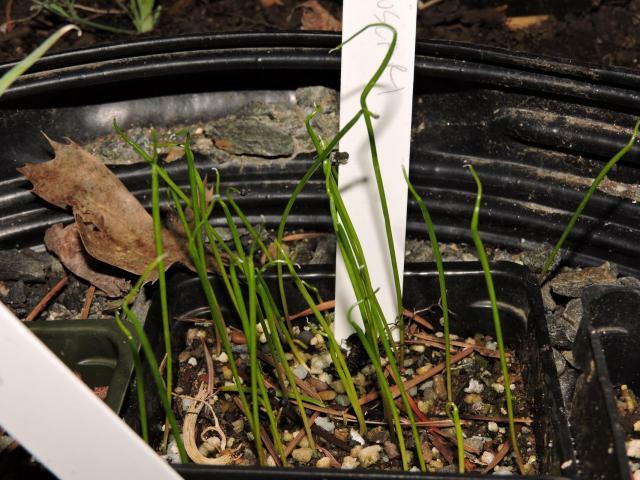 Photo below of a plant grown from seed labeled with this name from Mary Sue Ittner. 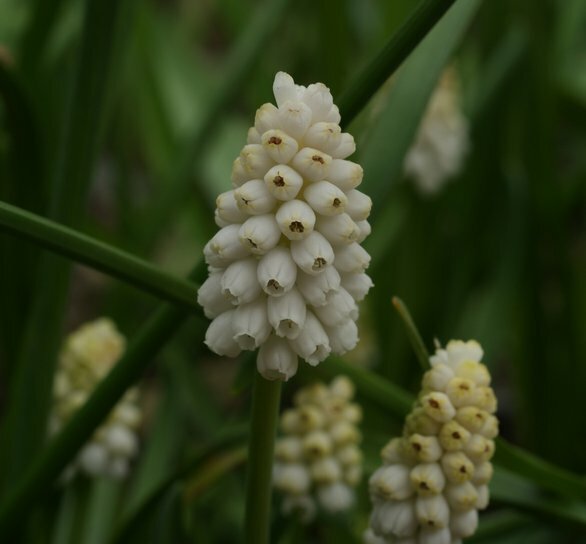 Muscari aucheri 'White Magic', a commercially available white version introduced in 2008. Photos by David Pilling. 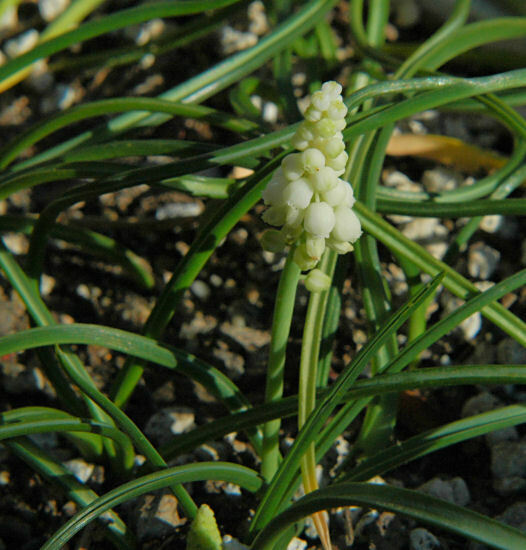 Muscari botryoides, a member of the Botryanthus group, is a species from the Mediterranean. 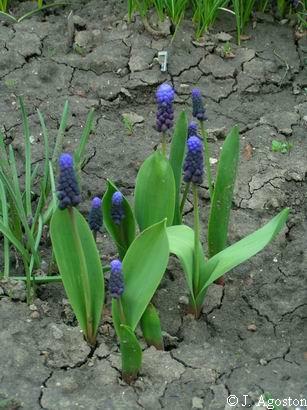 It is commonly called Grape Hyacinth and in some places can become weedy. The first photo below was taken by Tom Mitchell during March 2008 in Istria, Croatia.The next two photos from Mary Sue Ittner are of plants grown from seed. The last photo from Janos Agoston shows a white form. Muscari bourgaei Photos by Robin Hansen. 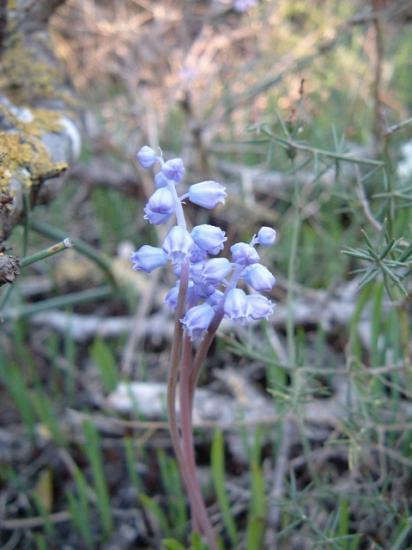 Muscari commutatum is native to SE Europe to the Aegean Islands where it grows in scrub and rough grassland. It is in the Botryanthus group. 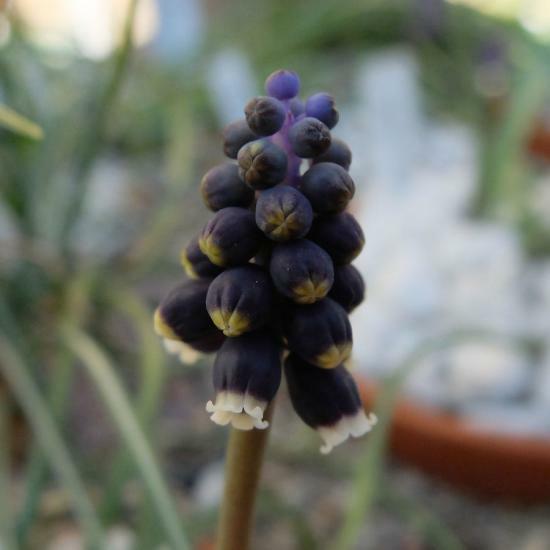 It is distinguished from other species by its very dark blackish flowers with black teeth. First photo is a white form, photograph taken in the alpine house in Wisley Gardens, Surrey, England, in March 2003 by Martin Philippo. 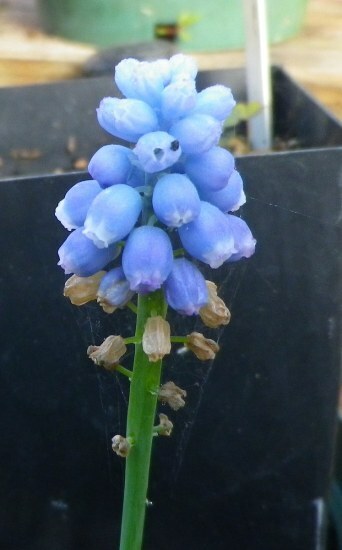 Sometimes wrongly labeled Muscari auchadra. Collected by Arne Strid at Achladea in the Peloponnese. Second photo shows the typical form. Photo taken by Oron Peri. 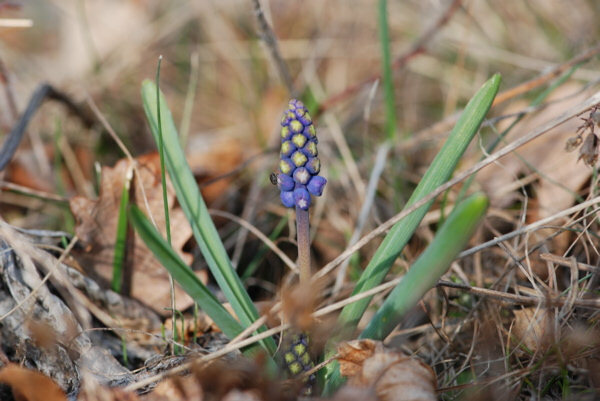 Muscari discolor comes from the steppes in Turkey around 1000 m. Photographed by Rimmer de Vries; RIGA-029 from Janis Ruksans sends up long leaves in fall. 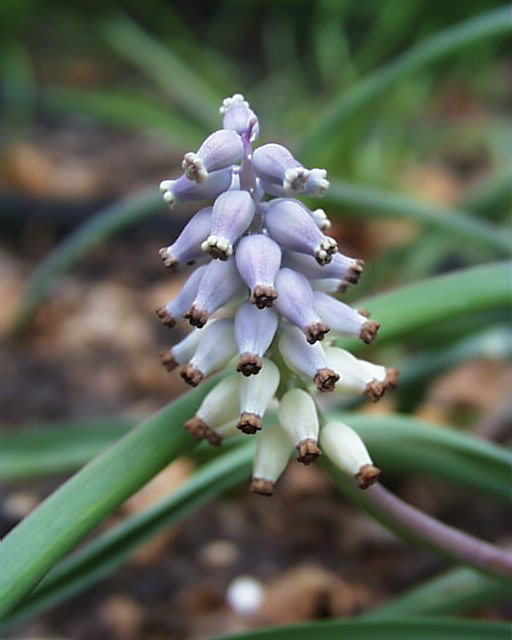 Muscari grandifolium is native to North Africa, in the Atlas and Rif mountains. It is a member of the Botryanthus group. 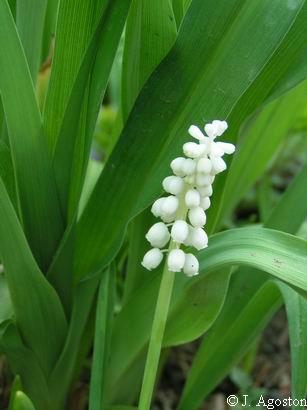 It is probably related to Muscari neglectum. Photo by John Lonsdale. 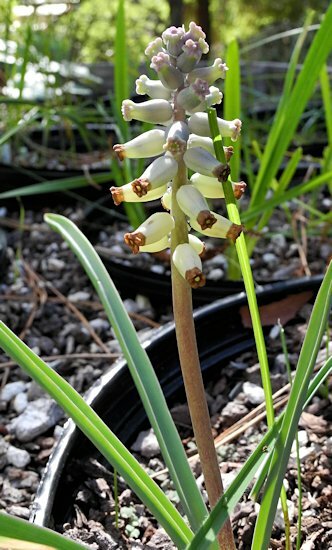 Muscari latifolium, a member of the Botryanthus group, is a native to NW Turkey, growing in open pine forests at ca. 1000 m, flowering in April. This species is widely available and was grown from seed flowering in three years. Photos by Martin Philippo and Janos Agoston. 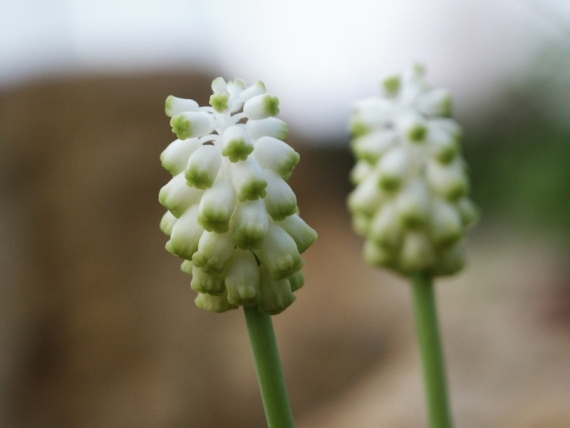 Muscari macrocarpum, one of the members of the Muscarimia group, is native to East Crete, the Amorgos Isles and southwest Turkey where it grows on dry, rocky places. 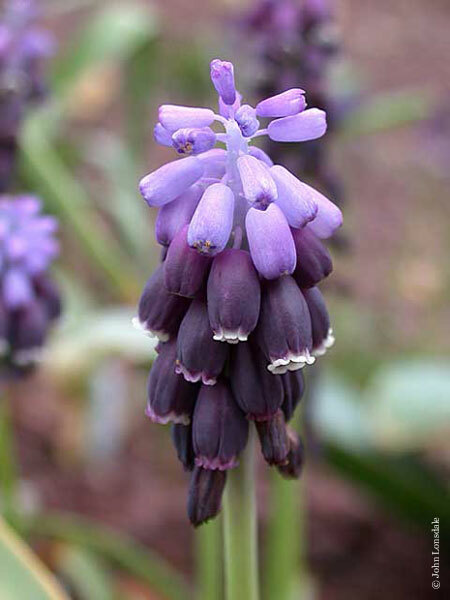 Like Muscari muscarimi it is fragrant and best grown in a bulb frame or alpine house in a deep pot to accommodate its strong roots. First photo is of a plant grown in New Jersey, by Arnold Trachtenberg. Second photo is of a younger inflorescence. 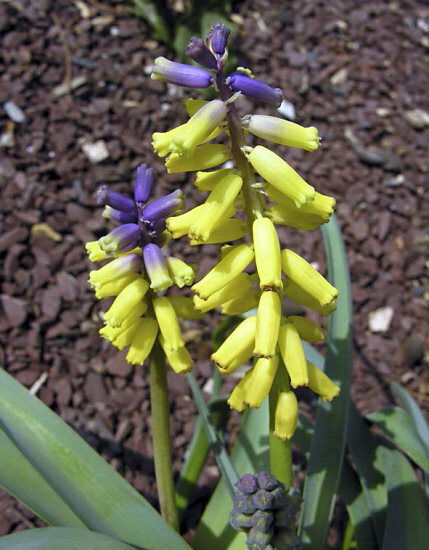 The flowers start purple and turn yellow as they mature. By Michael Mace. The final two photos were taken by John Lonsdale. 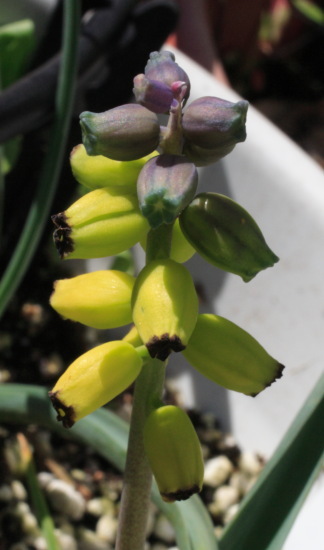 Muscari massayanum has grey-green leaves and flowers that are pink or purple in bud, changing to greenish-yellow with blackish-brown lobes. It is native to Turkey. It's not clear what group to place it in. 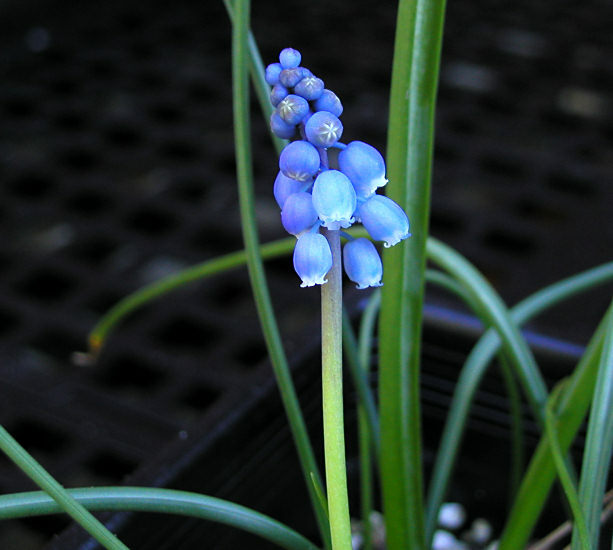 Brian Mathew includes it in the Leopoldia group, but does not assign it a synonym with that name and it is included in Muscari by the data bases that recognize Leopoldia as a genus. The photo below shows a strong resemblance to the Muscarimia group. 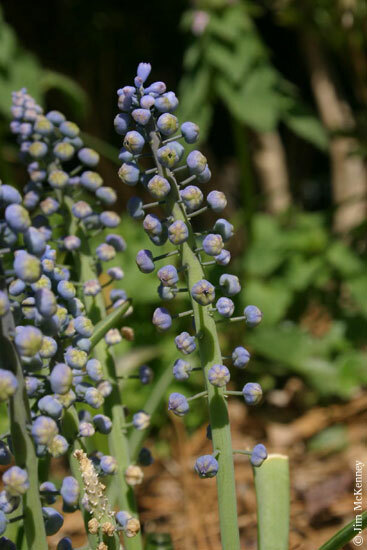 It was taken by Bob Rutemoeller showing plants blooming in Harry Hay's gardens in May 2004. 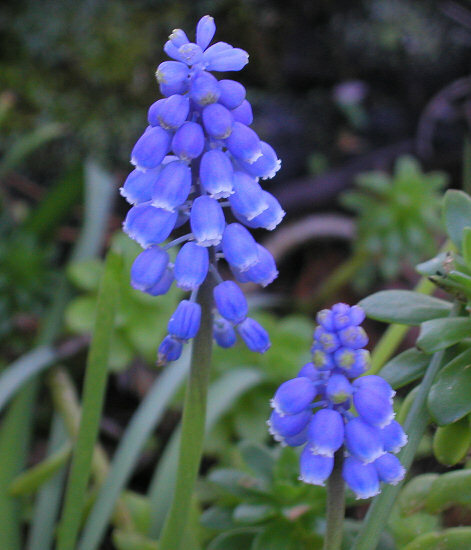 Muscari muscarimi, the other member of the Muscarimia group, originates in southwestern Turkey where it is found in rocky places. This species is the most sweetly scented member of the genus, having something of the musk scent after which it is named. 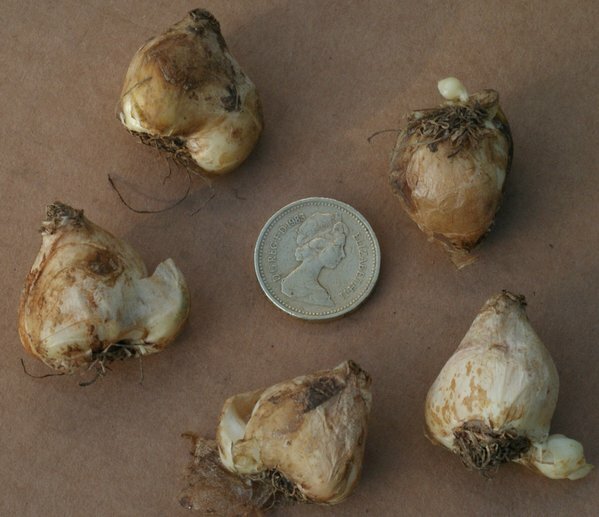 The bulbs are large with thick, fleshy roots that shouldn't dry out in summer. 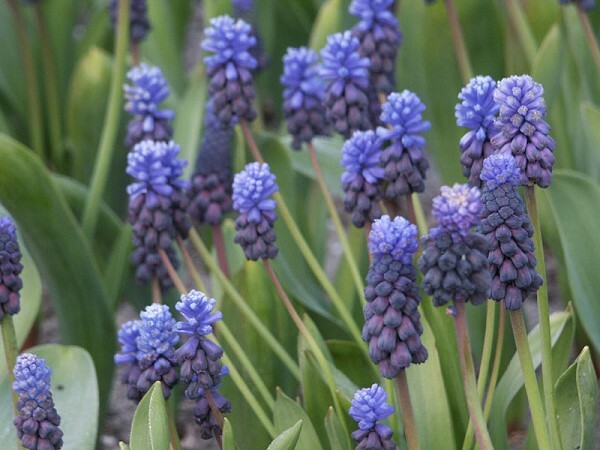 Muscari muscarimi flowers best if kept warm during their dormant period in the summer. Photos by Arnold Trachtenberg, John Lonsdale, Hans Joschko, and Mary Sue Ittner. The last photo shows a bulb on a 1 cm grid. 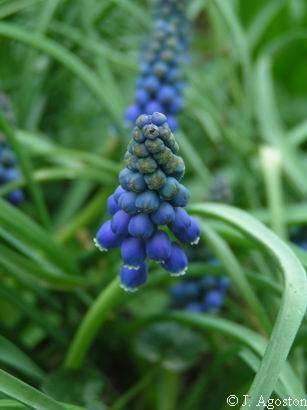 Muscari neglectum, a member of the Botryanthus group, has narrowly linear leaves and dense racemes of dark blue to blackish-blue flowers with white lobes. It is widespread, found in Europe and Asia. This species produces many offsets and therefore is considered invasive and unwanted by many. However, it is long-blooming and easy to grow. I've had plants in pots start to bloom in the fall, take a break during the coldest, wettest months, and then resume blooming for many months in the spring. If planted very deeply, it does not produce as many offsets. First photo by Mary Sue Ittner, second photo (of a very dark form) by Michael Mace. 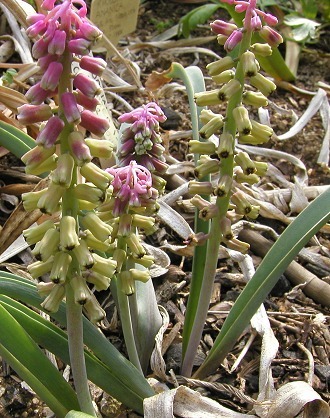 Muscari parviflorum is the only autumnal species in the genus. It appears just days after the first rain; leaves are partialy developed at flowering time to mature in a matter of a couple of weeks. It is very common in the Mediterranean, often in very large numbers. Photo taken by Oron Peri in Cyprus. 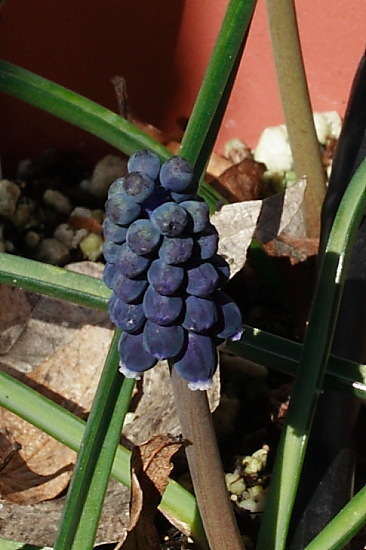 Muscari plumosum is not a valid name, but plants of Muscari comosum 'Plumosum', a cultivar, are sometimes sold under this name. See Leopoldia comosa for information and photos.